The Constitutional Court on Thursday ruled that the provisions governing the punishment of a doctor who conducted a surgical abortion with the consent of a woman and the woman who received the abortion are inconsistent with the constitution. The term “inconsistent with the constitution” is the decision that nullifies the law as virtually unconstitutional but allows it to exist temporarily until the National Assembly amend the law, to avoid any legal void and social confusion resulting from immediate nullification. 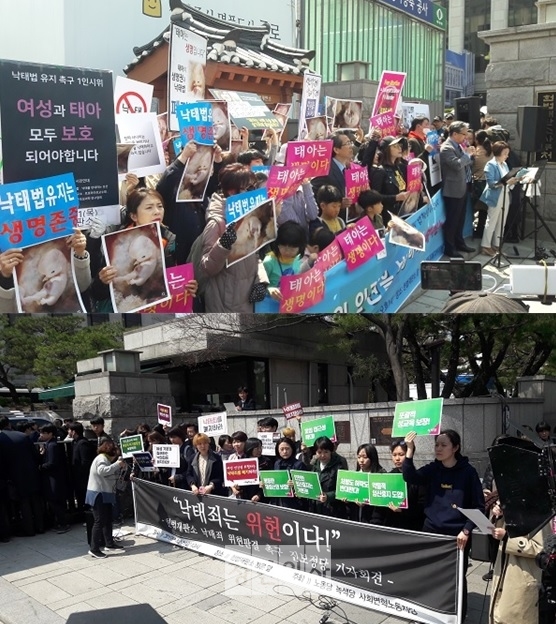 Pros (top) and cons of punishing abortion hold news conference to express their positions, in front of the Constitutional Court in Jae-dong, downtown Seoul, Thursday. Among the nine-member bench, four justices ruled the law was "inconsistent with the constitution," three "unconstitutional,” and two “constitutional. Legislators must implement the reform legislation by Dec. 31, 2020, at the latest, and unless the improved legislation is not made by that time, the provisions will lose their validity, the court added. Justices Cho Yong-ho and Lee Young-jin, who voted the provision constitutional, noted that the fetus is also subjected to the constitutional right to life, and expressed the opinion that the state can prohibit abortion to fulfill the national task of realizing the dignity for human beings. Article 269 is intended to protect the life of the child by preventing the abortion of the pregnant woman, they added. Before the Constitutional Court ruling, demonstrators from both sides gathered in front of the Constitutional Court to stage fierce protests. Those who sided with abolishing the ban on abortion argued that abortion should be removed as it threatens women's health rights, while those protest against the abolition claimed that the provision is essential to protect the lives of both the woman and the fetus, and urged the court to recognize the fetus as a life.